I don’t knit, and I don’t crochet. But the moment I stepped into Nomad Yarns on Main Street in Plainfield, Indiana, I really wanted to. The wide array of bright-colored yarns and intricate finished projects inspired me to want to create something. 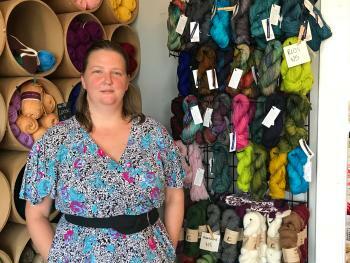 Opened and owned by Erica Kempf Broughton and her husband Dave, Nomad Yarns is tucked away in a bungalow. The cozy atmosphere of hardwood floors and multi-colored yarns from floor to ceiling left me feeling wistful. 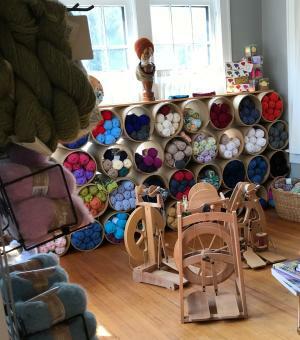 The shop stocks major yarn brands, knitting and crochet tools and spinning wheels and fiber. They specialize in natural fibers and higher end acrylics. Dave and Erica also teach a range of classes including knitting, crocheting, spinning, dying and felting. They love to help seasoned and newbie knitters alike. Veteran knitters can bring in their projects for feedback on colors or techniques. Brand new knitters can ask for help on picking patterns and materials. They can even sign up for a beginner’s class. The classes are geared for adults, ages 14 and up, but private lessons are also available. All teaching is done in house by Erica or her husband Dave. There’s also a once-a-month class making one afghan square each month using different techniques. At the end of the year, you sew them together to make your completed project. Every Thursday, from 6 to 9 p.m., anyone interested is welcome to bring their projects to the shop and work in an environment with others. It’s a great opportunity to visit the shop, ask questions, get inspired and see what others are working on. The couple even has their own line of patterns and completed projects which line the shop walls. Patterns are for sale online on etsy or ravelry.com. Erica started knitting in college when she was working a random job where she didn’t know anyone. The only thing nearby that interested her was a knitting store. She took a class, enjoyed it, and began knitting as a hobby. After completing her master’s degree and beginning her PhD while living in England, Erica decided she didn’t want to be an academic. When she considered what she wouldn’t mind doing for the rest of her life, knitting seemed like a viable option. She bought the house in Plainfield, sight unseen, and began renovating it as soon as she returned to the states. In three months, after repainting, stripping wallpaper and remodeling, the store was ready to open. In celebration of Nomad Yarns’ eighth anniversary this summer, the last weekend of July will feature specials, decorations, snacks and a local designer or yarn dyer, who will come in for a demonstration during normal business hours. 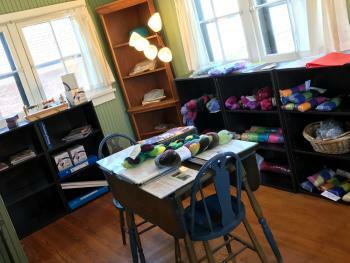 Even if you don’t knit or crochet, I highly encourage you to check out Nomad Yarns in Plainfield. If nothing else, you’ll meet a wonderful local couple and maybe get inspired to try something new. Where: 218 E. Main St., Plainfield, Indiana. Hours: 11 a.m.-6 p.m. Wednesdays, Fridays and Saturdays; 11 a.m.-9 p.m. Thursdays and 1-6 p.m. Sundays. Information: Call (317) 742-7456 or email erica@nomadyarnshop.com. Social media: You can follow Nomad Yarns across social media: Youtube, Facebook, Twitter, and Instagram. They even have their own podcast!